In the countryside, people usually plant fragrant cynanthe in front of their house not only to get cool but also to use the flowers as a kind of food. Fragrant cynanthe usually blooms in summer. It is a kind of creeper tree with heart – shaped leaves; its flowers grow in raceme and have a yellow green color. Especially, at night, you can clearly feel its fragrance, which is very comfortable. Fragrant cynanthe concludes vitamin C, B1, B2, and pro-vitamin A. These vitamins can make children grow fast and prevent the prostate of old people from being plump. They can also help to increase resistance. Therefore, fragrant cynanthe is widely preferred and used as a nourish food. We can make various dishes from fragrant cynanthe. It can be used to make hotpot, sour soup, dry with shrimp, or make sour vegetable…However, the most two popular dishes are fragrant cynanthe soup and fragrant cynanthe dried with beef. Cooking fragrant cynanthe soup is very easy. We can use either shrimp or meat to make the soup, but it seems that field craps would make the best fragrant cynanthe soup. To make the fragrant cynanthe soup with craps, we have to prepare the craps first. After remove their carapace and plastron, we clean the craps and grill them, adding a little salt. Then, filter the craps, keep the water and remove the residue. Cook the crap bouillon in a pot and use a spoon to stir it. When the bouillon is boiling, put the fragrant cynanthe in and gently stir so that the flowers would not be broken.Wait until the soup is boiling again and we can use it. Spoon the soup into a bowl and eat when it is still hot, you would feel how tasty the dish is. The flowers are fragrant and have a defined sweet while the soup with craps is so moreish. Using this soup in summer can help you reduce the heat in your body very effectively. Fragrant cynanthe dried with beef is also very popular and delicious. Lately, the dish has appeared more and more in some big restaurants and has been preferred much. The process of making the dish is also very simple. Keep the raceme of flowers; do not split them into small parts. Next, slightly clean them in cold water, then put them into boiling water and quickly take them out and pour cold water over again. Cut the beef into thin slices and embalm it with salt, pepper, sugar and garlic. Next, dry the fragrant cynanthe with chicken eggs on small fire in about one minute. Then, dry the beef, turn it over quickly. 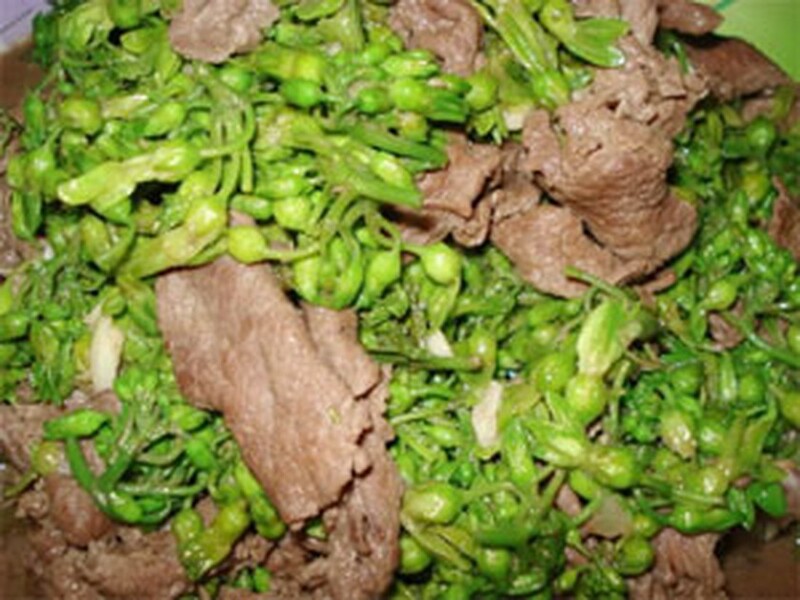 When the beef is cooked, put it on the fragrant cynanthe that we have already laid on a plate. Finally, sprinkle some pepper on the plate. We should enjoy the dish when it is still hot. It would taste better when it is served with fish sauce. Summer is coming again, and fragrant cynanthe is about to blooming. Although it is not a kind of delicacy, fragrant cynanthe is still very attractive because it is simple but nourish and the tastes it brings are so appetizing.